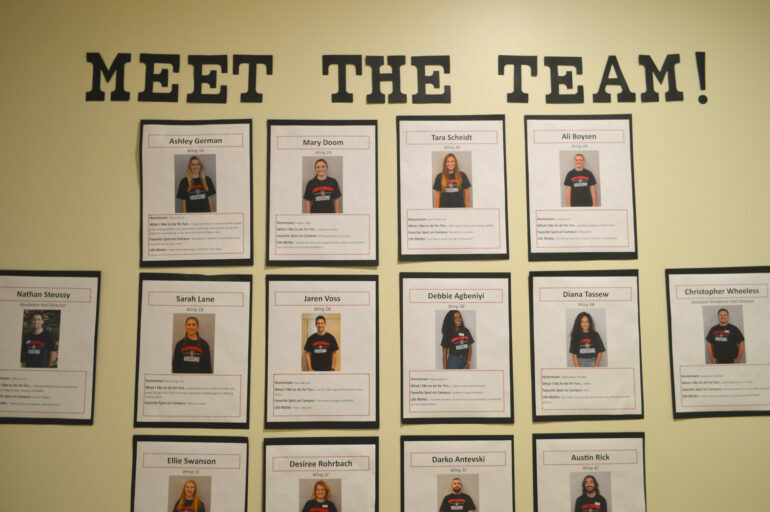 When students return to USD after the winter holiday break, some of them may be introduced to new resident assistants (RA) for their halls and floors. This change in leadership in the residence halls can be a product of previous RAs graduating, moving or deciding to give up the responsibilities that come with being an RA. Zackary Dadah, a first-year criminal justice major, serves as the new RA for Beede 1 after previous RA Mason Rogers left for a student-teaching opportunity. Dadah said when deciding to become an RA, students need to think of more than just the benefits and rewards. Wyatt Winchell, a first-year history education major and resident of Beede 1, had Brock Hardie and Rogers as floor RAs before Dadah took over Rogers’ position. “I was kinda surprised,” Winchell said. “Kids on my floor were saying that we had a new RA and no one really knew what happened to Mason (Rogers). Then we had a floor meeting and we all learned that Mason just took up a teaching position and he didn’t die like some kids were joking,” Winchell said. Antonio Hernandez, a first-year music education major and RA for Richardson 2, said he is also using this opportunity to gain experience for his future career. Hernandez also said being an RA has given him the ability to meet new people. Students can become an RA as soon as their second semester of college. Hernandez said that being an RA as a first-year student can be intimidating because some of his residents are even older than him. Although the position may seem scary, Hernandez said, it is really just about taking control and enforcing the rules regardless. “There is a lot of responsibility that comes with it buts it’s more reliant on other people. I’m just kinda saying the rules and it’s up to everyone whether they want to follow them,” Hernandez said.